There’s been nothing but praise for the San Jose Sharks trade which brought Erik Karlsson to the team. The Sharks returned plenty to the Ottawa Senators; at least six assets and potentially up to eight. Despite all the praise, there are some potentially awkward consequences, and we’ll take a look at those today. Overall, this deal reminded me of one decades ago in the NFL, where the Washington Redskins acquired one player and gave up five. The acquired player was future first ballot Hall-of-Famer Ken Houston (a safety for those unfamiliar). I recall a vivid description of the deal; it was like trading five pounds of ground beef for a filet mignon. No amount of ground beef will ever become a filet mignon. The deal, even at one player for five, was a bargain for the Redskins. Assuming Karlsson re-signs with the Sharks, I believe this is a similar scenario. You must have great talent to win in sports, and there is only so much great talent to go around. When opportunity allows a team to bring in great talent, they need to do it. 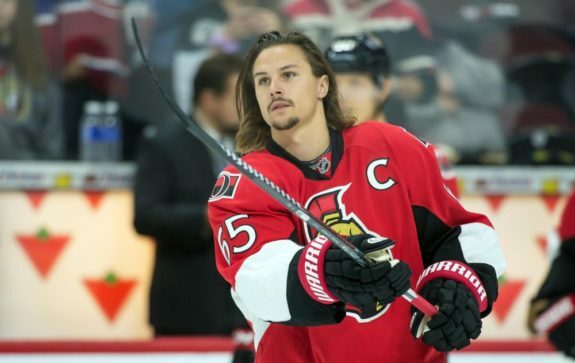 Two-time Norris Trophy winner Erik Karlsson is indeed, a great talent. I want to be clear I’m on board with the trade, but it helps to take a sober look at its ramifications. And not all will be comforting. I’ll start with where I left off in my last piece. 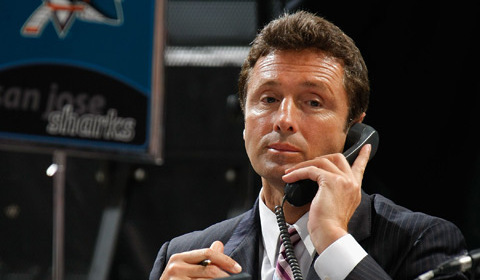 The Sharks major vulnerability is depth, and the trade actually increased this vulnerability. The departed players, Chris Tierney and Dylan DeMelo, played 145 games between them last season. As good as Karlsson is, he can only play 82. 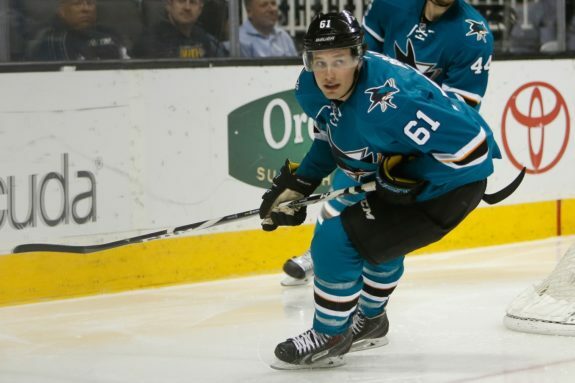 The Sharks also parted with Rudolfs Balcers, the top AHL player for the San Jose Barracuda last season; he had a very good chance to make the Sharks roster. They gave up two starters and a possibly third in this deal. Add this to other offseason moves and the Sharks only have 11 NHL proven forwards in the organization at this moment. They do have two ‘maybe’ ready forwards, but after that, the pipeline holds nothing which is considered near term. Prior to the Karlsson trade, the Sharks roster was well-constructed and well-balanced. The depth issues were very real, but as long as the starting 18 skaters were healthy, the Sharks appeared very competitive on every forward line and each defensive pairing. What was true before the trade may not be true now. The Sharks one offseason need was for a top line center, something they’d hoped to address by landing John Tavares. Alas, Tavares chose to go to the Toronto Maple Leafs. The need still remains. The Sharks top center, Logan Couture, is a fine player, but not quite at the level of other top tier teams (Couture did not make the NHL top 20 list for centers, 11 of the 16 playoff teams had a center on the list, with three teams having two). 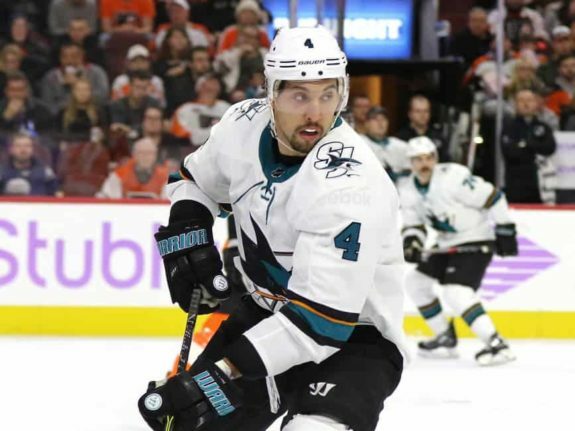 Next on the Sharks need list was an additional goal-scoring power forward to build on their foundation of power forwards. Max Pacioretty, the best power forward to move this offseason, went to division rival Vegas. On defense, the Sharks were pretty well set, but a strong defensive defenseman was probably the higher priority (Carolina’s Jaccob Slavin comes to mind). If the Sharks had one thing they didn’t need, it was an offensive-minded right-handed defenseman with a big shot. They already have one in Brent Burns. And another in seventh defenseman Tim Heed. And if this wasn’t enough, top prospect Ryan Merkley is, well, an offensive-minded right-handed defenseman with a big shot (Merkley’s still raw skill set does resemble Karlsson’s). Karlsson ups the team’s talent level a lot. But he doesn’t address the roster’s main challenges. We’ll take a deep look at the impact of the trade across the current roster, the issues raised and the potential to address them. I’ll start with the power play, because it has been essential to both Karlsson and Burns. With Burns on the roster, it might seem Karlsson is redundant in power play role. I don’t think so. I expect both Burns and Karlsson to operate on the top power play unit, with Karlsson acting the quarterback. He’s a natural while Burns is not. I’ll note Joakim Ryan is also a natural power play quarterback. He was outstanding with the San Jose Barracuda in this role and their highly productive power play was a thing of beauty with Ryan running it. The Sharks did not give him the opportunity last season. In Ryan, the Sharks already had a player on the roster capable of filling the power play quarterback role. As good as Ryan is, however, Karlsson is about the best in the business in this role, so there is no question he’ll be the man. But there is a second issue which gives me pause. The Sharks power play last season was exceptional with a relatively healthy Joe Thornton. Some may look at the season stat line and conclude the Sharks need help on the power play so they can improve on their ‘middle of the pack’ performance. But the Sharks need health more than help. In Thornton’s last 25 games before his injury, the Sharks scored 25 power play goals, a scorching rate (no team has reached a goal per game over a full season in eight years, and it’s rare a team is even close). At the time, it was the best power play in the league and second best was a long way back. The power play went from exceptional to well below average without Thornton. A healthy top unit doesn’t need Karlsson to be the best in the league. Karlsson might add incremental goodness, but it’ll be hard to top what the Sharks had going last season when everyone was healthy. 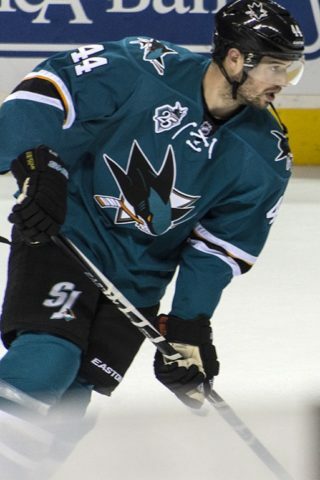 For several seasons, the Sharks have paired Marc-Edouard Vlasic with Justin Braun. They have been consistently excellent, more than the sum of the two talented parts. This is one of the league’s few shutdown pairings which lives up to the moniker. The Vlasic-Braun chemistry is undeniable; they each make the other better. In a twist most people missed, they delivered some serious offense last season as well. Among defensemen, Vlasic was among the league leaders in even strength goal scoring (finishing with more than either Burns or Karlsson), while Braun’s 28 even strength assists was good enough for a top ten finish. The pairing is a unique and valuable asset, no other team has anything quite like it. Breaking up this excellent pairing isn’t desirable. The bottom pairing last season consisted of Dylan DeMelo and Brenden Dillon. Again, the sum of the parts was better than either player. DeMelo’s game had plenty of issues, but he complimented Dillon well. It wasn’t DeMelo’s skill which created value, but the chemistry with his partner. It was this chemistry which kept Heed, a more talented player, from gaining the spot opposite Dillon. The Sharks got good value from this pairing at a cost a bit above league average for a third pair. The right-handed Burns was paired primarily with left-handed partners Paul Martin and Joakim Ryan, often depending on which player was healthy (combined, they played in 76 games, but played in the same game only once). It is a bit bizarre that Ryan was the team leader in plus-minus at plus-13, while Burns was dead last at minus-16 (and as low as minus-24). Martin was also a plus player at plus-3. The discrepancy between Burns and his partners is telling, if hard to explain. How can his two partners combine to be plus-16 when Burns finishes minus-16? Part of the explanation is this. Burns is not a ‘he can play with anyone’ sort. Martin was often called the “Burns whisperer” for his ability to get Burns to be his best self (including a well-deserved Norris Trophy in 2017). But for Burns to be so negative while the partners are so positive suggests getting the right partner for Burns isn’t just important, it’s essential. The task will fall to Ryan this season, and there is reason for optimism. The other left-handers on the roster, Vlasic and Dillon, aren‘t good fits. Vlasic has played with Burns and while the two are talented individually, they seem to produce at less than the sum of their parts. The less Dillon and Burns are on the ice together, the better. Their games simply do not mesh, and it’s been the case since Dillon’s arrival in 2014. So how does Karlsson fit in? I’ll make two assumptions. First, the Sharks continue to use left-right pairings and second, that Ryan sticks with Burns (because this almost has to be the case). 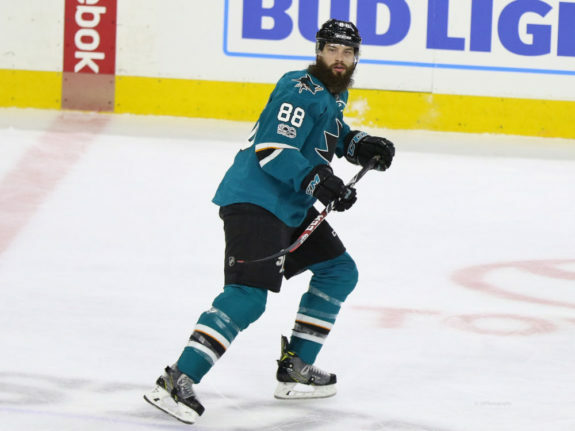 Do I break up Vlasic and Braun, the Sharks best pairing? If I keep them together, that leaves Karlsson with Dillon. Will a Dillon-Karlsson pairing work? Let’s just say I’m warming to the idea. 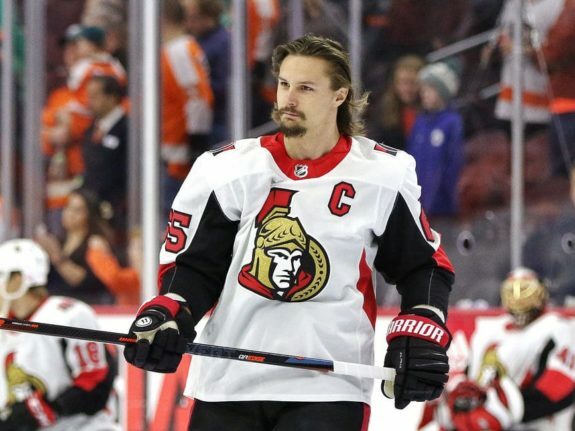 As my colleague Josh Bell points out, Karlsson was at his most effective when paired with Marc Methot, a player who resembles Dillon both in size and style. While Methot is probably a notch higher on the talent scale (and several higher on the snarl scale), having a compatible style matters. And it goes the other way as well. Dillon’s best partner to date has been DeMelo, a smaller, quicker and more agile sort. While the skill and talent level of DeMelo are many notches below Karlsson, style-wise, they are somewhat similar. I don’t think this is the way San Jose goes, but it is a viable path. Plus it keeps the Vlasic-Braun pairing together, which is not a small consideration. It’s worth noting Karlsson is routinely among the league’s ice time leaders, so either San Jose would need to cut down the ice time of the team’s best player, or increase the ice time of Dillon, the weakest of the Sharks defensemen. Dillon has averaged 17 minutes a game in recent seasons, Karlsson 27. Is there a happy medium between those two points? The alternative pairing, Vlasic with Karlsson seems the more likely path. But breaking up the Vlasic-Braun pairing, perhaps the best shutdown duo in the league coupled with above average (and under the radar) offensive pop, is at least a bit risky. In theory, you’d lose something defensively, but gain a bunch offensively. I’m also wary of the duo losing their identity. They have a great mindset and it is built around being the best shutdown pairing in the league. One visual sticks with me which represents this pairing for me. Against the Edmonton Oilers, Connor McDavid came off the bench and headed on to the ice. I happened to be watching the benches at that moment and noticed Vlasic and Braun. Vlasic and Braun come into every game focused on shutting down the opponent’s best. They love their role and embrace their identity with enormous passion. They stick with the top opposing players so intensely, I almost expect them to go to the opponent’s locker between periods. As much as I’m concerned about taking away their partnership based on their skills and chemistry, I’m equally leery about messing with their identity. While I think Vlasic-Karlsson works, moving Braun next to Dillon is a question mark. You can expect the Burns-Ryan pairing and the Karlsson-Vlasic pairing to eat up enormous amounts of ice time. Easily 45 minutes a night, perhaps closer to 50 at times. So do you relegate a pretty good defenseman in Dillon and very good defenseman in Braun to just 15 minutes a night? And will they have good chemistry? Dillon has had (by my count) six partners in San Jose (Burns, Heed, DeMelo, Roman Polak, David Schlemko, Matt Tennyson). But it hasn’t been a pairing with the most talented where’s he’s been most effective. It’s been with DeMelo, who is probably fifth in talent on the list of six. It isn’t just about talent, chemistry and fit matter a lot. We don’t know if Braun-Dillon will pan out, even though both players are far more talented than most third pairing defenders. A $7.07 million cap hit applies to the Dillon-Braun combo. If it seems like a lot of money for a third defensive pairing, well, it is. If this happens, it is the priciest third pair in the league at roughly double the league average. The cap hit is consistent with a second pairing on a good team. The Flyers made the playoffs last season and $7.07 million is enough to cover five of their seven defensemen! It’s also a bigger cap hit than any two Vegas defensemen! The third paring in this arrangement is an inefficient use of cap space. The money can get spent elsewhere and deliver more value. And this is before considering whether Braun and Dillon work well together. While I think is likely, it is not a given. The truth is simple enough. Dillon is good enough to be a second pair defenseman in this league, while Braun is on the borderline between first pair and second pair. There’s also a risk that one or both might get frustrated with reduced minutes, well below what they might receive elsewhere. While some others hedge about this being the best defensive group in the league, it doesn’t include me. This is the best defensive group in the league and next best (Nashville as I see it) isn’t particularly close. But when I look at resources and consider the constraints, things aren’t quite as cozy. Karlsson’s arrival creates a logjam on defense; with cap space heavily weighted to this group and not enough ice time to go around. Burns and Karlsson probably should get around 25 minutes of ice time a night, Braun and Vlasic about 22. Ryan should spent most of the game with Burns (except on special teams), which puts him around 20 minutes a night and Dillon is fine at 17, though he’s physically capable of more and would be asked to handle over 20 himself on many teams. This adds up to 131 minutes. Putting two defensemen out at all times yields 120 minutes of defensive ice time. This figure turns out to be a bit high since many teams (including the Sharks) use only one defenseman on the power play. Call it 117 minutes of available ice time a game for the defensive group. The players want to play, but as long everyone is healthy, it’ll be very challenging to keep everyone happy with their ice time. But more critically, the Sharks had achieved a defensive group where the pairings were better than the sum of their parts and collectively, they were an elite group at a fair cost. Karlsson’s arrival disrupts this. Too much talent is a nice problem to have (far better than too little talent), unless it spills over into other parts of the team. Given team resources are constrained by things like cap space and ice time, it spills over into other parts of the team. The bigger ripple effect comes on the forward lines. Tierney’s departure leaves a hole for a third line center. He was genuinely good in this role last season after struggling to fill the role in prior seasons. The Sharks have only 11 forwards with meaningful NHL experience (12 if you count Dylan Gambrell’s three NHL games, but I don’t think this qualifies as meaningful). The Sharks have enough centers, even in Tierney’s absence, but deploying them wisely is going to be a challenge. Last season’s centers were Thornton, Couture, Tierney, Joe Pavelski, Eric Fehr, Ryan Carpenter and Barclay Goodrow. Tomas Hertl also can play center. Fehr, who was really good in his fourth line role after being acquired at the trade deadline, is gone. Carpenter is also gone. Hertl belongs on Couture’s wing; he excelled there last season. The idea of moving him back to center, where he hasn’t been as effective, is just a bad one. This leaves Couture, Pavelski, Thornton and Goodrow. Goodrow is a natural winger, though I thought he filled in admirably in his brief center stints. Still, it isn’t ideal. On the opening day of training camp (Sept. 14), Thornton and Pavelski were on the same line (as they’ve been for several years), leaving the third and fourth line center roles up to two players unfamiliar to most Sharks fans; the aforementioned Gambrell and Finnish import Antti Suomela. It isn’t clear either is NHL ready. In the three games Gambrell appeared in last season (the final three of the regular season), he wasn’t NHL ready (though the experience gained will help him going forward). Under the scenario which opened camp, the Sharks will be a top heavy team, with two excellent forward lines and two ‘hold your breath’ lines. We’ve seen time and again the benefits of having four strong lines. One could argue (and probably win the argument) the Sharks fourth line was their second most effective in the playoffs last season. While Marc-Andre Fleury stole the series, the Sharks skated evenly or better with the Vegas Golden Knights in all but one contest and the fourth line was an important part of it. I am a fan of line balance and the Sharks can easily become very unbalanced. If the lower lines are a liability, it puts the onus on the top lines with the top players. Importantly, it leads to larger minutes for these players. The top six are Evander Kane, Thornton, Pavelski, Hertl, Couture and Timo Meier. 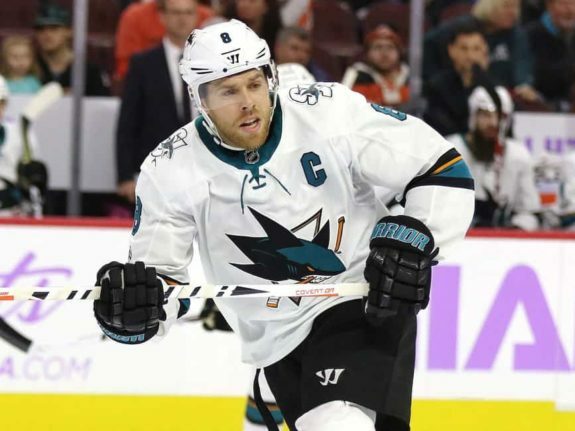 Last season, three of the six – Thornton, Kane, Pavelski – missed considerable time or played while hurting to the point their game was significantly compromised. Over the last four seasons, Hertl and Couture average about a dozen missed games per season. Handing this group increased workloads is an approach which screams “not sustainable” over the long haul of an NHL season. 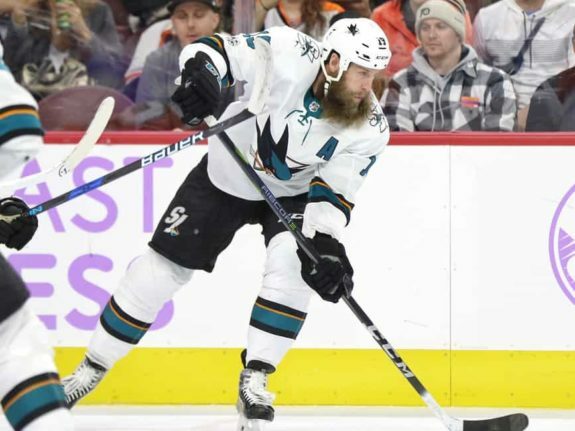 If San Jose Sharks head coach Peter DeBoer decides to split up the Joes, giving Thornton one line and Pavelski another, that can help. With Thornton recovering from a second knee surgery (they surgeries occurred roughly nine months apart, the most recent in late January 2018), it seems wise to limit his ice time early in the season when he is most vulnerable. Even with Thornton and Pavelski handling separate lines (which would be the right thing to do whether Tierney was here or not), the Sharks will still have a question mark at the fourth line center spot. Something which wasn’t an issue with Fehr in this spot for last season’s playoffs. The Sharks fourth line was a significant team advantage last season, it won’t be this season with the current roster. The third line was also effective, it may also be diminished as compared to last season. A great defensive group and two excellent lines can do a lot of good. But it can be undone if the lower lines are not good enough. In the NHL, teams are very good at exploiting their opponent’s weak links. And as of now, the Sharks have some exploitable weak links they didn’t have last season. The Sharks penalty kill was the league’s very best last season, allowing a net of only 26 goals all season (34 allowed, eight scored short-handed). Second best was 31, third best was 34. In other words, the penalty kill was really effective. Tierney was the team’s top face-off man on the penalty kill and led all Sharks forwards in ice time (by a good bit). He was effective in the role. A figure of minus-1.00 per ten minutes of ice time on the penalty kill is pretty close to league average, Tierney finished with a 0.81 figure, mostly against other teams first unit, which is an excellent figure. This is another role which will need replacing, and it may fall to already heavily-used players like Hertl and Couture to fill the void. It’s not hard to figure out where this is headed. Doug Wilson constructed a roster with one hole which would have been perfectly filled had Tavares signed in free agency. It didn’t work out, but one has to admire the masterful planning and foresight Wilson used to put him in position to make his bid a very competitive one. Wilson is now trying accomplish similar things by taking a different path. We know he values a well-constructed roster; we have the evidence. He got the talent upgrade he sought, but not the roster balance. Not yet. Balance comes from taking the places the roster is overweight in talent and cost, and shifting it to where it is underweight. It’s clear the defense is overweight and the forward lines, especially the depth, is underweight. The direction of the next move is obvious, though the details will wait for the right opportunity. A move will come at the expense of a defenseman and the return will upgrade the forwards. Vlasic and Burns have contracts which make it very hard to trade them. Karlsson will demand a similar clause in any deal he negotiates. The Sharks need Ryan to partner with Burns. Which leaves Braun and Dillon, who I expect are both looking at their future with the Sharks through a different lens about now. I doubt either player is naive about the ramifications. Each player has two years left on their current contracts; both will look at how their new roles will affect their next deal. I doubt Braun wants to go into his next negotiation after having played two seasons on the Sharks third pairing. Dillon might also be looking for a team where he can get a second line role. It may not go down this way, but it sure feels like one or the other is the natural outgoing trade piece which bolsters the forward lines and rebalances the roster. The Sharks are a much more talented team, as the addition of Karlsson far outweighs the subtraction of Tierney, DeMelo and Balcers. The latter three may all wind up with solid NHL careers, but they aren’t close to Karlsson’s talent. Yet Karlsson’s addition takes a team which was very balanced and throws this off. It also takes a vulnerability, lack of depth, and increases it. Players who’d established good chemistry together may find themselves playing apart. Others will find themselves playing less than their skill merits. There is real potential for an exploitable weak link among the lower forward lines. The penalty kill will miss a very important piece. The imbalance on the roster may force increased playing time to some players who probably are better off with less playing time (as a means to reduce injury risks and to keep them stronger for a playoff run). The potential for this deal to have a cascade effect in the wrong direction is there. Doug Wilson knows this. I expect the Sharks GM to add talent on the forward lines, while parting with someone on defense for a lower cost alternative. Braun and Dillon are the top candidates for this. Teams pay a premium for quality defensemen and both players have two years left on “good value” contracts. There is no need for a fire sale or a rush to make a move. Wilson can get full value for either player. Before any of this happens, though, I expect Wilson to lock up Karlsson for the long run. It isn’t worth rebalancing the roster until he’s signed on for a lot more years. If it turns out Karlsson is a one-season rental, the Sharks are best off keeping the rest of the core together. 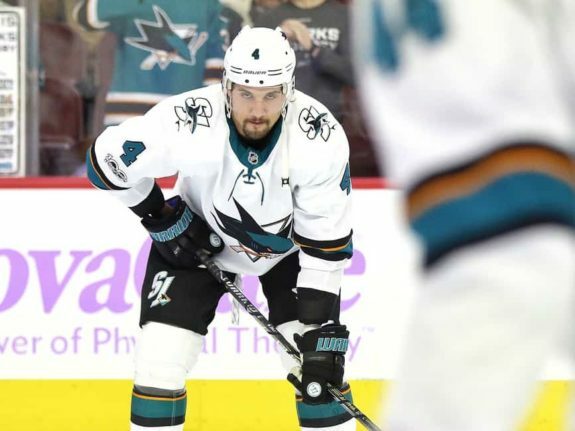 The side effects of the Karlsson trade will to require the Sharks to make at least one additional significant move to rebalance their lineup and improve the team. Ultimately, I think this is path the team needs to take. • I’d be remiss if I didn’t at least mention ‘Burns to forward’ which some people have brought up (and I’ve advocated at times). This move, coupled with splitting up the Joes, would do almost all the needed rebalancing. The chances of it occurring are essentially zero. • One thing I was remiss in mentioning, the Sharks are now largely immune from a single injury on the blue line derailing their season. In years past, anytime Vlasic missed games, the Sharks record nose-dived. Their defensive will be among the best in the league, even if some players, even Vlasic, miss games along the way. And if the Sharks keep this group together, there will also be a benefit in lengthy overtime playoff games, when the minutes can become enormous. The Sharks can continue to use all three pairs relatively evenly; many teams keep their weaker links on the bench in overtime.